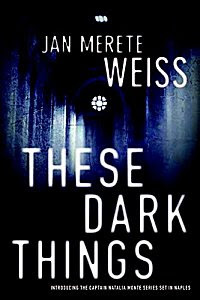 The beginning of These Dark Things, Jan Marete Weiss's new police procedural set in Naples, shows off the author's strengths, description and scene-setting. The crime scene in the crypts and ossuaries of a church aptly named for the souls in purgatory is marvelous, and Weiss goes on to give a first-rate portrait of the purgatorial Naples of today, the Camorra, corruption, and garbage with Vesuvius in the background. The writing is also first-rate, except for a certain stiffness in the dialogue, and the characters and plot are set up in interesting ways: a German student who knows too much about the city's street shrines (and the contract that the Mob has with the Church to collect the donations from the shrines), Captain Natalia Monte of the Carabinieri and her Buddhist partner, various secondary characters from the Church, the University, the Camorra, and Natalia's life. But neither the characters nor the plot are really developed. It was the descriptions of Naples that kept me reading; except for the power of the imagery, I might not have finished this relatively short (224pp) book. The characters don't progress beyond their initial framing, and the plot is complicated but undeveloped (it's like a string of incidents, without much connection from one to the other). When the solution to the original murder comes along, and the violent consequences to the other plotlines follow, the reader isn't surprised or moved—it's just more stuff added to the string. But Weiss's writing does promise something that I hope can be accomplished in future novels in the series, enough that I will surely read them when they arrive in print. On a recommendation from someone very well informed about Italian crime fiction, I recently read two other novels in which the setting is the main interest, both by John Grisham (not my usual cup of tea). The novels are The Broker (set in Bologna) and Playing for Pizza (set in Parma, but not a crime novel). Grisham, of course, does know how to construct a plot and can certainly portray three-dimensional characters. But it is mostly a very good tour of these cities of Emilia-Romagna that I took away from the books (and I'd definitely pass along the recommendation of both books on that score). But Weiss and these two efforts by Grisham prove to be evidence that contradicts a complaint heard not long ago that crime fiction is just literary tourism: these books are very good as tourism but do not rise to the level of the best international crime writing, whether about Italy or the rest of the world, writing that uses these settings to construct full, complex, and rewarding reading experiences. I gave up reading Grisham quite a long time ago, because of quality plunge (not all that great to start with!) but I did recant for the one set in Bologna and I enjoyed it. As usual with him the plot was hopeless but the Bologna-setting parts were wonderful, he is really so good at "placeism". I've read another review of These Dark Things but am not that tempted, so far - maybe because it is not actually Italian? Thanks for the comment, Maxine. Other outsiders have written good crime novels about Italy (Nabb, Leon, Timothy Williams, and recently Tobias Jones, whose second book is on my tbr list). In a way, though, I think an outsider is better positioned as well as more tempted to give the kind of tour guide that Grisham and Weiss give. Yes, it is a bit like the Icelands we see through the novels of Indridason and Sigurdardottir compared with the new series by Michael Ridpath, which is actually much more informative about Iceland to the outsider, as the author is such an enthusiast for the countryside, literature, history etc and includes it all in his plots, unlike the Icelandic authors where this is all implied. I like both approaches, actually - and I do recommend the Ridpath books if they are available in US - I reviewed the first for Euro Crime if you want to check out, and the second is out in UK later this month, my review is "in the queue". The protag is a cop who is half American, half Icelandic (well, Icelandic actually but grew up in US and joined Boston PD before being seconded to Iceland for various plot reasons). The strength in THESE DARK THINGS is the sense of menace created by the information the author adds, seamlessly, to the story about the Camorra. Naples own organized crime syndicate is more dangerous than the Sicilian branch with which we are more familiar. The battle over the collection of waste has gone on for years, seriously undermining the health and quality of life of the Neapolitans. Weiss includes informaton that can be found in the non-fiction book, GAMORRAH, written by Roberto Saviano. Saviano has been in hiding since the publication of the book. GOMORRAH is a breathtaking look at the ways in which the lives of the people of Naples have become controlled by a crime syndicate. Thanks, Beth, the reference to Gomorrah (and by extension to the very interesting movie made from it) is very pertinent to what Weiss is trying (and sometimes succeeding) with. Melville House: I sent an e-mail to your intern, but you can contact me at notpd@yahoo.com and yes, I can accept submissions.